The first manned flight of NASA’s Orion deep space capsule – currently under development – could slip two years from 2021 to 2023 due to a variety of budget and technical issues, top NASA officials announced on Wednesday, Sept. 16. The potential two year postponement of Orion’s first flight with astronauts follows on the heels of the agency’s recently completed rigorous review of the programs status from a budgetary, technical, engineering, safety and risk assessment analysis of the vehicles systems and subsystems. But Orion’s launch delay has already been condemned by some in Congress who accuse the Obama Administration of purposely shortchanging funding for the program. Based on the budget available and all the work remaining to be accomplished, liftoff of the first Orion test flight with an astronaut crew is likely to occur “no later than April 2023,” said NASA Associate Administrator Robert Lightfoot at the Sept. 16 briefing for reporters. NASA had been marching towards an August 2021 liftoff for the maiden crewed Orion on a test flight dubbed Exploration Mission-2 (EM-2), until Lightfoot’s announcement. Lightfoot added that although August 2021 is still NASA’s officially targeted launch date for EM-2, achieving that early goal is not likely as a direct result of the program review. Orion is being developed by NASA to send America’s astronauts on journeys venturing farther into deep space than ever before – back to the Moon first and then beyond to Asteroids, Mars and other destinations in our Solar System. Orion’s likely launch slip is the direct fallout from NASA’s recently completed internal program review called Key Decision Point C (KDP-C). The KDC-P review assesses all the technological work and advancements required for launch to design, develop and manufacture Orion and that can be accomplished based on the Federal budget that will be available to carry out the program successfully. “The KDC-P analysis just completed and decision to move forward with the Orion program is based on a 70% confidence level of success,” notes Lightfoot. “EM-2 is a full up Orion on a human mission,” he said. The EM-2 mission would last about 3 weeks and fly in a lunar retrograde orbit. It would carry astronauts beyond the Moon and further out into space than ever before. Prior to EM-2, Orion’s next test flight is the uncrewed EM-1 mission targeted to launch no later than November 2018 – from Launch Complex 39-B at the Kennedy Space Center. EM-1 will blastoff on the inaugural launch of NASA’s mammoth Space Launch System (SLS) heavy lift booster concurrently under development. 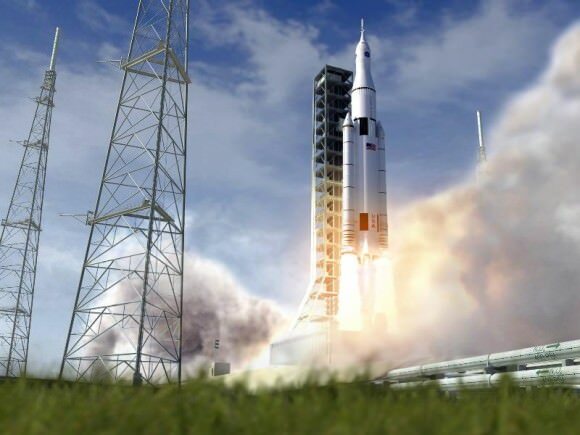 The SLS will be configured in its initial 70-metric-ton (77-ton) version with a liftoff thrust of 8.4 million pounds. It will boost an unmanned Orion on an approximately three week long test flight beyond the Moon and back. Toward that goal, NASA is also currently testing the RS-25 first stage engines that will power SLS – as outlined in my recent story here. Orion learned a lot from EFT-1 and the lessons learned are being incorporated into the EM-1 and EM-2 missions. Among the very few changes is an alteration in the heat shield from a monolithic to a block design that will vastly simplify its manufacture. “We are making the heat shield change as a result of what we leaned on EFT-1,” said William Gerstenmaier, the agency’s associate administrator for Human Exploration and Operations at NASA Headquarters, at the briefing. 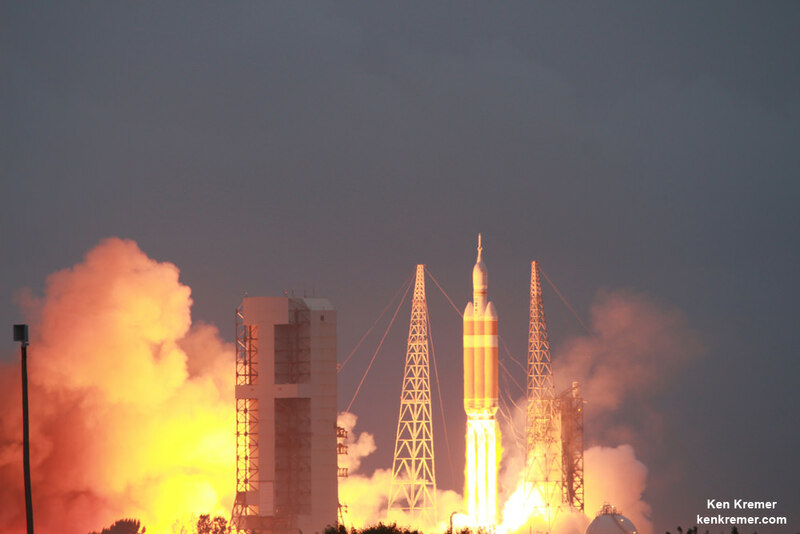 Some members of Congress and others have said that delays in the Orion and SLS program are also a direct result of funding shortfalls caused by budget cuts in the programs, and condemned the Obama Administrations 2016 NASA budget request. In fact, the Obama Administration did request $440 million less in the 2016 NASA budget request vs. the 2015 request. “Once again, the Obama administration is choosing to delay deep space exploration priorities such as Orion and the Space Launch System that will take U.S. astronauts to the Moon, Mars, and beyond, said Rep Lamar Smith (R-Texas) House Committee Chairman of the House Science, Space, and Technology Committee. “While this administration has consistently cut funding for these programs and delayed their development, Congress has consistently restored funding as part of our commitment to maintaining American leadership in space,” said Chairman Smith. A couple of years ago, there was an article on another site that indicated that NASA was planning on using the Exploration Upper Stage – a more powerful second stage – for the EM-2 mission. Since the first mission is scheduled to use the interim cyrogenic upper stage, that would mean that EM-2 would use a previously-untried upper stage for a manned launch, which is contrary to NASA policy. The article therefore posited that there would have to be another SLS launch between EM-1 and EM-2. Because SLS launches are very expensive, the article posited that the earliest EM-2 would launch would be 2023. (1) Whether NASA is still planning on using the Exploration Upper Stage on EM-2? (2) If so, will there have to be another SLS launch between EM-1 and EM-2 and, if so, did these factors play a role in this announcement? Anyone else starting to wonder whether we really got to the Moon in only 9 years while learning and building everything from scratch, and with computer technology far inferior to a dollar store pocket calculator today? Hi, Jim. The important thing to remember about the early years of NASA & the space program is the Red Scare/Cold War/M.A.D. context under which it all took place. The so-called “space-race” has often been spun as a sort of technological “Olympics,” where the real winner was the advancement of human science (and thus all Mankind, world peace, Kumbaya, et cetera), with a harmless bit of national pride thrown in in the form of a gold medal video of your country’s flag planted on the lunar surface. In reality, the manned space program was a perfect cover for the rapid, intense development of all missile-based warhead delivery systems, to include launch/lift systems, tracking, remote control, and targeting, among others. After all, it’s waaay more difficult to lift a manned crew on an ICBM, fly them around on a controlled trajectory, land them in a controlled fashion on another body in the solar system, then bring them back to Earth (while keeping the crew alive through the ENTIRE process, hello) than it is to simply loft a brick of plutonium half way around the globe. If you took everything out of the Apollo stack except warhead(s) and targeting systems, and then imagine what a Saturn V COULD have carried? Then you’ll realize that the whole huge expenditure of money — and the big drop-off in manned spaceflight programs afterwards as well — actually makes ridiculously practical government sense: we haven’t been back to the Moon because we no longer have any need to prove we can hit Moscow with a 250MT warhead with <100m accuracy. No other space goal has been worth that kind of government money, so no such programs have been funded.